Below is the schedule for our upcoming conference with Abp. Ben Kwashi of Nigeria. Please understand that start and end times for conference events will not change, but occasionally a shift of schedule is necessary. We would like for you to make note in the schedule that the first day (Friday, February 3) is for clergy and licensed lay pastors (and their spouses) ONLY. The second day (Saturday, February 4) is for everyone. Registration will close on January 27, 2017. 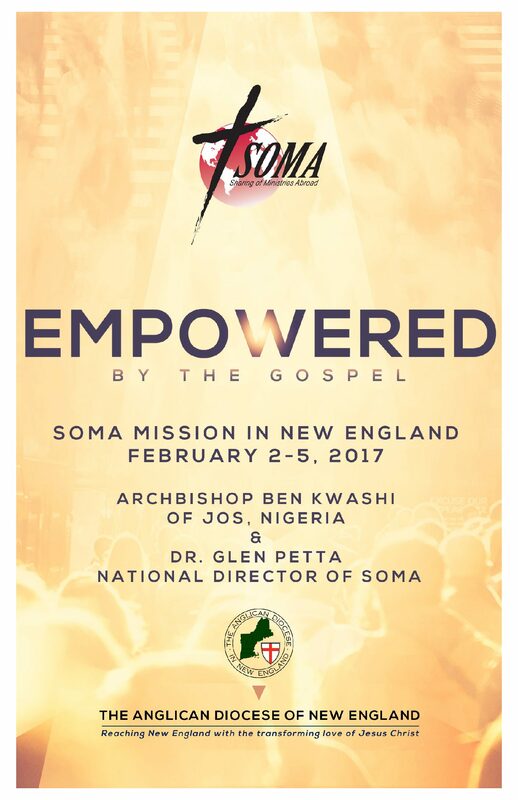 Registration for attending any or all of the conference is $20 and covers the celebratory dinner which will be served on Saturday, the 4th, at All Saints’ Cathedral. If you can attend Sunday’s service, lunch will be included. Please register and pay online, or you may register online and send a check. Registration at the door will be $25. There will be on-site coffee stations and snacks available in the fellowship hall. There are numerous off-site dining options within walking distance of the church for lunch and dinner on Friday, and lunch on Saturday. There will be a map and a list of local eateries made available at the conference. If you choose to bring your own meals with you, please bring your own utensils, plates, etc. There is one microwave and a refrigerator on-site for those who need it, but keep in mind space may be limited. The celebratory closing dinner will include soup, salad, and desert. There will be some gluten-free options, but other dietary needs may not be available at this time. If there are any severe allergies, however, please let us know in the field below. For those clergy and guests visiting from long distances, we have blocked out rooms at the Hampton Inn, Amesbury. Please make your reservations as soon as possible. The group rate is available from Thursday, February 2 to Sunday, February 5 (3 nights). You may book any or all of those nights, as clergy may need more nights stay than traveling parishioners. The cut-off date for making reservations at the discounted rate is January 10, 2017.